Jo-Ann Page is an oil painter and a sculptor. 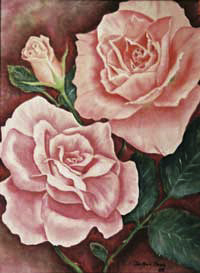 She began painting in 1978 while living in Hawaii. She has since studied with talented oil painters in Hawaii, Montana, and California. Her portraits, landscapes, and seascapes hang in homes from Massachusetts to California. Jo-Ann began sculpting and carving stone while a student at California State University Stanislaus where she was graduated with a degree in Studio Art with a minor in Psychology. Since then, she has been creating bronze sculptures, sculpted dolls, and stone carvings in addition to paintings. After leaving the University, she attended workshops with well-known sculptors. Her bronzes and alabasters now grace homes in California and Hawaii. New in this area, Jo-Ann is a former member of the Society of Western Artists, the Arbor Gallery in Merced, CA, and the board of the Merced County Arts Council. She has recently joined the Santa Clarita Artists’ Association.